A few hours after my last post, I returned to the Lake Lila road. It was still gated, so I began the long walk in to pick up our gear and two canoes. On the way I met a DEC truck that was raking the road. When they finished, they opened the gate, so I was able to drive in. That saved me five to six hours of pulling a canoe buggy on a dusty road swarming with black flies. I was grateful. In the hour or so that it took me to retrieve my stuff (including two carries from the lake) and drive back up the access road, three vehicles with paddlers arrived, including one from Ithaca and one from Vermont. Imagine the disappointment if these people had shown up on the Friday evening of Memorial Day weekend and found the road closed. By the way, should you ever drive to Lake Lila and find the road gated, turn around and drive down the road a piece to the put-in to Little Tupper Lake or Round Lake. 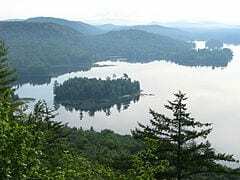 If you choose Little Tupper, I recommend canoeing to the west and and taking the Rock Pond outlet to Rock Pond, a beautiful lake with several nice campsites and a big island. You also could head north on Route 30, take the turn for Horseshoe Lake, and look for the access road to the Bog River. 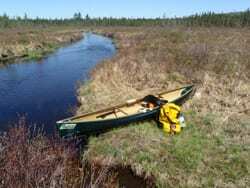 You can canoe up the Bog to Hitchins Pond, where there are campsites. If you want to go farther, portage around the Upper Dam to access Lows Lake. Of course, the black flies were still out in force Friday evening at Lake Lila. My Phil, you sure like roads when they benefit you. Ha! You’re right, Jim, I don’t mind driving on roads.